Hope's Cafe: Dove Hair Care Brush With Greatness Sing4All Contest!! Dove Hair Care Brush With Greatness Sing4All Contest!! Beginning today through November 21, groups of 3 to 10 people are invited to submit a video performance featuring the complete lyrics to “My Favorite Things” from “The Sound of Music.” Viewers are encouraged to vote on their favorite video performance at DoveSing4All.com to help determine the four finalist teams. On December 3, the four final teams will be announced, and each will receive a gift package from Dove Hair Care and a personal coaching session (via video conference) with Broadway icon Idina Menzel. From December 3rd - 20th viewers will vote for their favorite of the final four videos atDoveSing4All.com to determine the Grand Prize Winners. The Grand Prize winning team will be announced on December 22 and will have the ultimate experience of performing “My Favorite Things” as the opening act at the Radio City Christmas Spectacular on December 28 in New York City. Entries must include at least 3 and no more than 10 on-camera participants – 13 years of age or over. The complete, original lyrics to “My Favorite Things” along with the Official Contest Rules are available on DoveSing4All.com." This sounds like a really fun contest! Dove recently reinvented their hair care, and has some great products I'll probably be trying out next time I need shampoo. 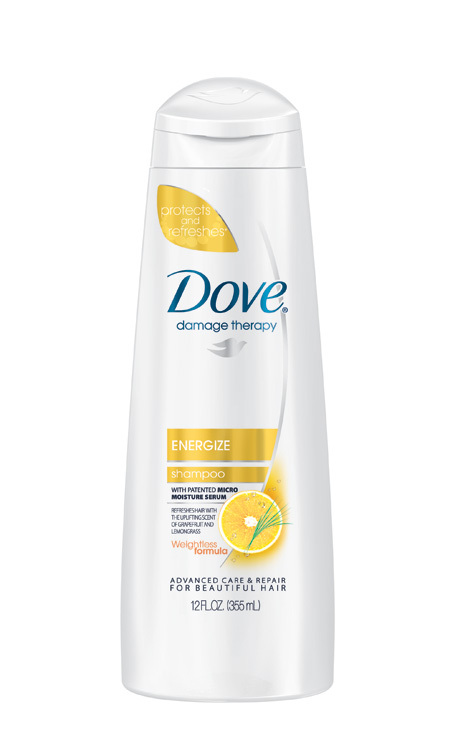 The entire Dove Hair Care line has been reinvented with a new formula containing Fiber Actives. It also continues to include Micro Moisture serum to protect against and repair hair damage for beautifully smooth hair. In addition to the new formula, the line features a new look with premium-looking, sleek satin white bottles and an updated scent that includes fruity, floral and woody fragrance notes. Dove Hair Care takes care of the damage so women can keep doing their favorite things, be it styling, bleaching, straightening, driving with the convertible top down, or wearing a ponytail. The collection is available in food, drug, mass and club retailers." Purchase your favorite things: Starting Nov. 2, women can get two of their favorite things – Dove Hair Care products and a meticulously restored and re-mastered 3-disc Blu-ray/DVD combo pack of The Sound of Music – at their favorite retailer nationwide. Women can watch one of their favorite films over and over as well as keep doing their favorite things to their hair because Dove will take care of the damage. Chance to win your favorite things: Dove Hair Care is giving away exclusive film-themed prizes including: individually numbered The Sound of Music Limited Collectors Sets packaged in a keepsake box and featuring a 100-page “My Favorite Things” scrapbook, anniversary soundtracks and Blu-ray/DVD combo packs. Chance to experience your favorite things: One grand prize winner will receive the ultimate Sound of Music experience – a trip to Austria, sponsored by the Salzburg Tourist Office and the Austrian Tourist Office, to see the picturesque Alps where the famed movie took place. 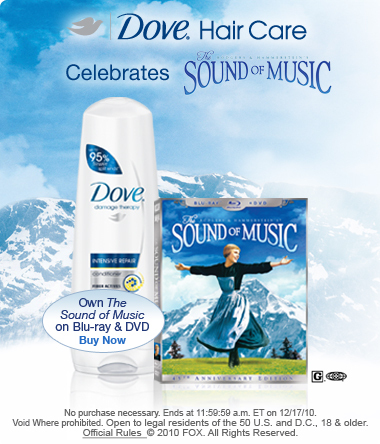 To enter and learn more, visit www.dovehair.com/soundofmusic. Fans can also engage with Dove Hair Care and The Sound of Music through both Facebook and Twitter at Facebook.com/Dove and Twitter.com/Dove." I encourage you to go check out these great contests! And remember, the Sing4All ends Nov. 21, so that's just over a week away! Hurry up and get your videos submitted!!! Disclaimer: I was not monetarily compensated in any way for this review. I will receive a full-size bottle of Dove Shampoo as a thanks for this post. All thoughts and opinions are mine. All quotes taken from the Dove website.